Thanks for all your help Cheryl!! I have really enjoyed working with you and look forward to working with you again in the future!! 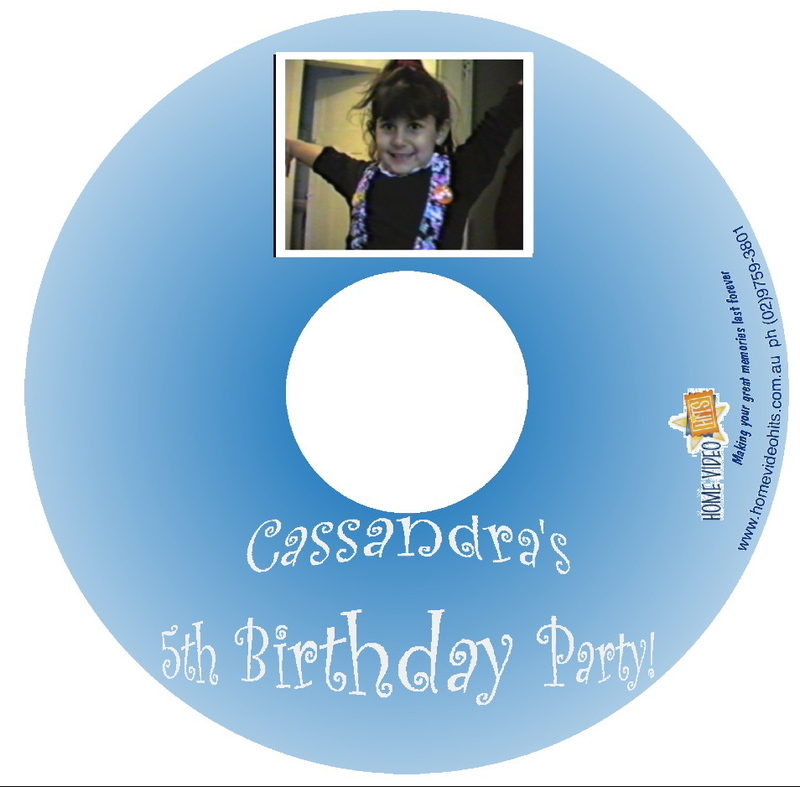 Cheryl created for my daughter's birthday ~ 'An Amazing Video' ~ We viewed it at her party, and there were so many tears and laughter from the story Cheryl created with the footage I gave her, as well as photos. It was so much more than what I expected and I am so thrilled to have found her ~ Thank you again Cheryl, we all just adored it!! If you'd like to check out any of Craig's videos, you can follow the UnknownViking74 on YouTube. We watched the DVD last night and are very happy with the way it turned out. With the SD card problems and ordinary footage, I didn't expect it to turn out so well - thank you very much. The team at Elevate Performing Arts would like to express our thanks for the wonderful job done by ‘Home Video Hits’ on our end of year concert. We have had such fantastic feedback from all the students and parents on the quality of your DVD. The hours spent making sure all children’s faces were featured and even close ups during the trophy presentation and speeches at the end of the concert were evident. The menu at the start of the DVD was user friendly and very creative and appropriate for a dance school! Not only was your work fabulous but the personal touch and communication with yourself was priceless. we will be recommending your service to many friends and family! I really want to say thank you so very much for the video/DVDs. Our granddaughter Olivia said it was the best birthday gift she had received ever in her life. She, friends and family had a wonderful time watching and re-watching. Priceless. You are so blessed to work in an area that brings so much joy. Thank you so much for the DVDs. I enjoyed them so much. If I ever need another conversion, I'll definitely come to you. I'll be sure to recommend you to friends and family. I have recently received my newly converted training videotapes to DVD format. I was most impressed by your prompt service and helpful advice to ensure a professionally produced library of training DVDs. The way you enhanced the quality of some of the older tapes was unexpected. Thanks to your recommendation, the scene selection feature you created means I now have the ability to go straight to a particular scene within the training DVD. Also the attention to detail in creating the content images on the DVDs face and covers is appreciated. I have no hesitation in using Home Video Hits again, nor recommending your services to friends and professional colleagues. I recently produced a full length movie to commemorate my family's company's 100th year anniversary. I came to Cheryl with over 2 hours of video interviews and a massive list of requests - including fixing the audio tracks, cleaning up the background noises, lightening the visual footage, fixing the soundtrack, adding titles and generally making the whole video more professional. It was a massive task, but Cheryl did a fantastic job. The result was better than I could have hoped for. Aside from her skills, I really appreciated the effort she made to get to know what I wanted out of the project and her recommendations were spot on. I would certainly highly recommend her services for any professional or personal project. Thanks so much Cheryl!!!! I just wanted to drop you a line to thank you for your work on our recent BBQ video recipe project. Dealing with a professional company like Home Video Hits made the whole project that much easier to manage and the result is fantastic. The editing work that you did even surprised me and having professional videos on our website is really helping to “sell the sizzle” with potential customers. Thanks again Cheryl and we look forward to working with you again in the near future. I just wanted to thank you again for your fantastic work getting all our home videos onto DVD. You were so efficient and your work is very professional. What I liked most about Home Video Hits is the fact that you’re trust worthy and reliable. My family’s home videos are important and personal but I knew they were in good hands with you. Thanks again for your incredible work. I would highly recommend your services to anyone. I just wanted to drop you a short note to thank you for the great work on our DVD. We watched the finished product with the kids on the weekend and everyone loved it. You were spot on about the music – it really makes the video and I thought your choices were excellent. Thanks again for your help and I’ll be in touch again soon to get you to do some more holidays for us! Thank you for doing such a brilliant job editing our videos of Felix. I'm glad I heard your ad on Vega a couple of years ago as I would have never gotten around to doing the job myself and especially not looking so professional. You are offering a very good service and I wish you continued success with your business. I certainly will highly recommend your services to anyone who wishes to compile their video memories and look forward to working again with you when the next batch of footage needs converting. I can't wait for my husband and the boys to watch the video. I thank you for the great editing work you did for Elevating Food Safety Pty Ltd. You provide a very professional and extremely timely service. Your creativeness and editing skills are outstanding. Your cost structure is very competitive and I will certainly being using your services again. I recommend Home Video Hits to any organisation or family. The DVD was such an exceptional present to our Mum. My mother and perhaps 100 other guests who viewed the DVD at her 50Th birthday were blown away by the high quality movie. People roared with laughter at the funny clips, cried at the grand kids segment and oohed and aah ed through the rest of it. The music fitted everything perfectly and the high quality of photos/videos/music worked seamlessly together. People had great comments all evening and continue to tell my mum how wonderful it is. For my Sister, Brother, Grandparents and Myself it was an amazing trip down memory lane and I cannot thank you enough. My mother continues to watch it and thinks it is embarrassing at parts, but overall so amazed that we went to the effort and basically blown away by it. Thank you for your time and energy spent tackling the project. You were lovely and very professional to deal with and your product was a fantastic movie that we will all continue to watch for years to come. I could not think of a better present for a loved one. I just wanted to thank you for the most amazing and obviously time consuming job in converting the videos. I would have needed a year to do that, what an incredible service based on people's cherished memories. You have done a really fantastic job. You should charge more for such work. Just a short note to thank you for the wonderful work you did compiling the DVD for me. The picture and sound quality of the 21 videos from which the scenes were to be extracted were very mixed, however, the way in which you adjusted the sound and colouring, and brought everything together, was amazing. This made all the difference to the end-result. I’m thrilled with the DVD – it certainly would not have been an easy job for you – a testimony to your patience and expertise. I will certainly be recommending you to my friends to that they can save their precious memories onto DVD. Thank you, again. Thanks for the great video. Tony and I are very pleased with your work and how it turned out. Its a 100% great feedback that we give you. You'll probably receive this e-mail from me at about 2 a.m. And you'd probably be guessing why I stayed up so late this time? That's because I love it so much, I kept playing it over and over again!!!! It's out of this world, it's brilliant, simply phenomenal! Thanks a million Cheryl! I love the way you have choreographed it. It is indeed a hallmark of a true professional. You captured the soul and essence of it, avoided the wrong details, hit home-run at every single turn, and had the words capture the meaning so perfectly, and what's wonderful about it is you did it with perfect timing. Not only did you take the words out of my mouth, you orchestrate it so so well to match the song. And I know what you mean by the silence at the end. It's brilliant! It allows the whole feeling to sink in right at the end, and at that point I'm sure I'll hear lots of sob sob from my sweetheart and from the floor, and then the video fades away gracefully. And it's just perfect with the night background... couldn't be better. All in all, just perfect! Love it! Blockbuster indeed! and I can say that again! I cannot thank you enough for the fantastic wedding DVD you so very artistically put together for us. Even though the original video was such a disaster, you put something so professional, artistic and beautiful together. Our wedding DVD will be a treasured valuable to us. Thank you so much for your patience and kindness in answering questions, in all the editing you did, the ideas you so gently suggested etc. Thank you also for the beautiful music track you did for us for the DVD as well as for the photo track. We sent a copy you made to Ian's parents, as his Dad was too ill to fly down for the wedding. Well they loved the DVD so much that they have played it again and again to capture the essence of the day. Everyone who saw it did not realise that this was possible and it is so much cheaper and professional than getting a video guy. I plan on bringing my parents old photos as well as baby videos etc for you to transfer and compile more DVD's. I look forward to seeing you and seeing what marvel you will create with the next lot of photos and old videos. Kind Regards and our most grateful thanks. "I viewed my son’s Christening and cried throughout it. He is now nearly 18 and time has clouded my memory. I heard his baby cry and all my memories came back. It was good to see my father and his love for my son. The video also has persons who have since passed away and it was good to relive that time when they were around. I am so grateful to you Cheryl (I am glad our paths have crossed). Your work is a gift bringing back those things which really do matter – our family and friends we love." "I wanted to thank you for making such a beautiful montage for my daughter. It was a surprise for her on her 16th birthday, and she was happily surprised, embarrassed, proud and thrilled all at the same time. It was appreciated by not only her friends but her family -great grandma was brought to tears! My husband said to have one made for her 18th and 21st! Thankyou for your patience and understanding." "I am an actor in an industry that requires new ideas & ways of promoting yourself. Home Video Hits gave me an un-bias insight as to how my ideas should be put together to give the best effect for my showreel. I am extremely happy with my final product. 5 star service & quality at work! Thank you again." "Thanks very much for creating such a great DVD for us, it is absolutely so precious to us and worth a hundred times more than we paid for it. My husband and I both get teary each time we watch it - which is the ultimate sign of success!! I'm so glad that I found you, and I didn't embark on editing the videos myself, I never could have done such a good job (no matter how long I tried) so I am definitely planning to use your services on a regular basis now that we have realised how lovely it is to watch a perfectly edited video of our family." "Cheryl was terrific - She captured the mood of our whole day. The music she chose was perfect and she incorporated our photographs and a video made by a friend. It has been viewed many times and shared with friends - we would recommend Cheryl to everyone. She is a professional and her costs are minimal when ranked in terms of its wonderful memories. We never planned to pay for a professional video but this combination was perfect." "The passion and determination to produce the WOW factor for her clients is very evident. It seems Cheryl leaves nothing to chance when looking for ways to bring satisfaction to her clients. There is no doubt that the ‘Customer is King’ in the Home Video Hits business! "The process was so quick and easy. After having this video for almost 17 years and watching it at least once a year, it was about time I had this turned into a DVD. The DVD itself is fun to watch and the Highlights are great. I would definitely recommend friends and family to Home Video Hits." "Thank you Cheryl. I found your personal and friendly service an absolute pleasure. You worked with me and my ideas to produce a DVD that captures the essence of our special day in a very easy viewing format. “Home videos are very personal and precious memories for families and for this reason, parting with or entrusting them to someone else, even temporarily, can be quite difficult and stressful. However, after presenting us with our wedding video, which was very cleverly done with a brilliant musical comedy piece to finish, I had no hesitation in asking Cheryl to edit the home movies we had taken of our growing family. Once again, she has done an excellent job and produced a beautiful permanent memory which captures all the aspects which were important to us. Rod McDougall - Charity Event for the Rotary Club of Strathfield Inc. 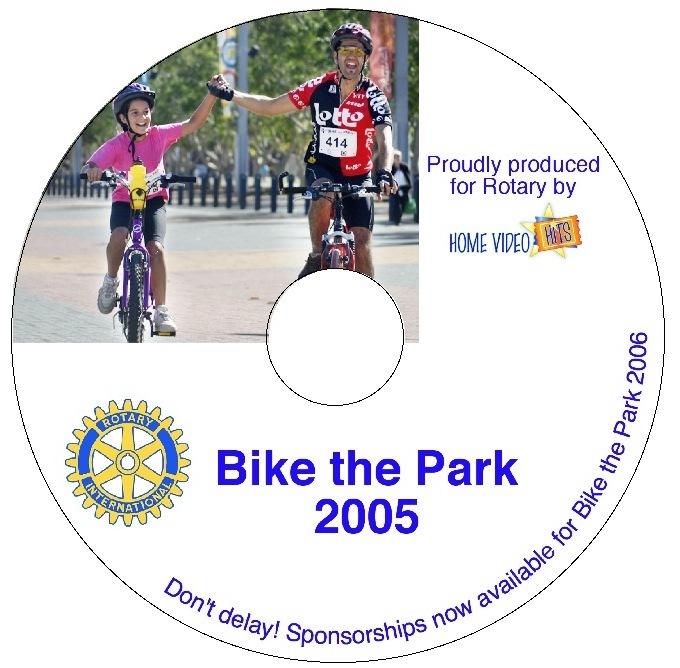 The videos of our Rotary Club’s charity fundraiser bike ride held at Sydney Olympic Park are fantastic. And most importantly, a version for use in attracting major organisations as sponsors of the event. Thanks, in particular, for your special efforts with the latter. It is high quality, captures the essence of our event, and will be invaluable in securing future sponsorship.